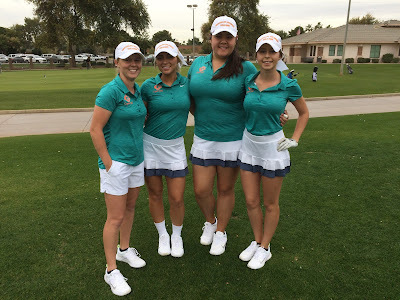 The Coyote women’s golf team continue to make major strides on the golf course. The golfers led by freshman Taryn Simmons placed second in the Estrella College Invitational on February 27 & 28 at Tres Rios Golf Course in Goodyear. Simmons, a graduate of Queen Creek High School, shot rounds of 87/86 for a fourth placed medal finish. Sophomores Mariola Szmit placed seventh while Anahi Buck and Emily Smith tied for eleventh to secure the Coyote’s team finish. “I am very proud of our team and the success we are having this season,” said Coach Mark Underwood. “It will be a golf filled Spring Break for the team as they play back to back tournaments on March 12, 13, 14 and 15!” On behalf of everyone at CGCC, good luck in your upcoming tournaments. Go Coyotes!